Australia is no stranger to extremely large placer nuggets. The aptly named “Welcome Stranger” (uncovered in 1869 a mere 2 inches beneath the surface near Moliagul, Victoria) weighed a whopping 3,523.5 troy ounces untrimmed of gangue material, with over 2,500 troy ounces of pure gold. Remember, there are 12 troy ounces in a troy pound, so all of these nuggets were in the multi-pound range. Just imagine hefting multiple troy pounds of natural gold in your trembling hands (not to mention the dollar signs dancing before your feverish eyes!). If you are one of my Aussie “fossicking” or nugget hunting friends the Wedderburn District is a logical starting point for your search for larger nuggets (although I suspect many other nugget hunters have already revisited the Wedderburn area). The District can be reached via the Calder Highway some 2.5 hours northwest of Melbourne. I remember quite well when the news of Kevin’s find reached the States. 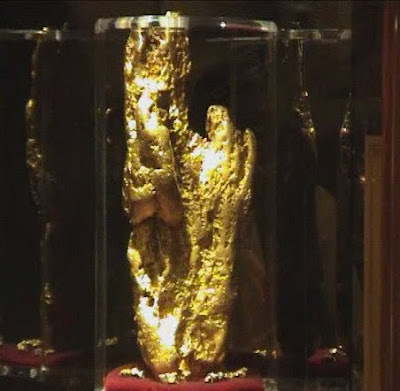 The "Hand of Faith" (and it’s rumored selling price of over one million US dollars) created a tremendous interest here among miners and treasure hunters, many of whom rushed out to purchase state-of-the-art detectors intending to try their luck in many historic American goldfields that had lain fallow for many years. A few of these intrepid souls even journeyed Down Under to try their luck in the heavily mineralized soils of the Australian outback. I honestly believe that Kevin’s find was the starting point for electronic prospecting and nugget hunting as we know it today. 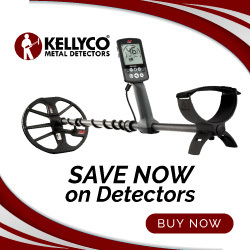 All of you who employ the latest Pulse Induction (PI), very high frequency (VHF), or ultra high frequency (UHF) metal detectors designed and manufactured specifically for electronic prospecting or nugget hunting owe a debt of gratitude to Kevin Hillier and all the other “oldtimers” who paved the way for you. Trust me, detector technology in the early 1980s was nothing like it is today, and working iron-rich, heavily mineralized soils like those found in Australia’s goldfields could be an absolute horror at times. It was extremely difficult and frustrating work that tried one’s patience and knowledge to the max. There's more to come regarding this subject in a future post. Take good care until then. If you liked this post, you may want to read: "Working Bench Gravels: One Canadian Miner's Success Story"